Rate this Article GearVR is, without a doubt, one of the most powerful smartphone-based HMD that you can buy in the market. Read on to find out more about this amazing piece of technology! As high-end smartphones are getting more and more powerful, it is no wonder that Samsung, a leading smartphone manufacturing company, has released a virtual reality head-mounted display (HMD), GearVR, which uses the processing power of a smartphone to allow you to experience virtual reality. Coupled with their collaborative efforts with Oculus, the top tech company behind the revolutionary virtual reality headset, Oculus Rift, GearVR is definitely a VR headset that every virtual reality fanboy, or girl, should keep their eyes on! In terms of specifications, GearVR is, without a doubt, one of the most powerful smartphone-based HMD that you can buy in the market. 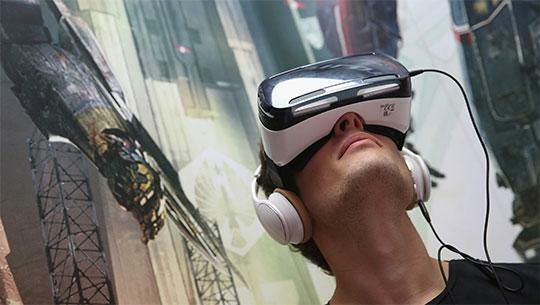 As GearVR can only be used with high-end smartphone models like the Galaxy S6 Edge+, Galaxy S6 Edge, Galaxy S6 and Galaxy Note 5, the HMD will be able to fully utilize the phones’ Super AMOLED displays that produces a sharper and less grainy image as opposed to the normal AMOLED displays due to the increased number of subpixels. The processing power of these phones is also powerful enough to ensure low latency when you navigate in the virtual world. Not to mention, the HMD itself is able to employ the smartphone’s sensors, namely a gyrometer, accelerometer and proximity sensors, allowing the device to have very precise head-tracking. The device even boasts of a relatively wide field of view of around 96 degrees. In terms of design, GearVR has a unique design which removes the strain on your neck when the headset was worn, making the device rather comfortable to wear. The HMD itself has a quite large touchpad at the side and a plethora of buttons, like the volume key and the back key, to help you adjust your phone’s settings since you won’t be able to use the touchscreen on your phone. Of course, there’s also the focus adjustment wheel that you can use to adjust the lens distance between your eyes and the phone. Furthermore, Samsung is currently selling 2 types of GearVR – an older Innovator’s Edition and the latest consumer-ready version. The latest release of GearVR has worked out some of the chinks in the Innovator’s Edition. For instance, the HMD itself is redesigned to make it a lot lighter, further reducing the stress this device will place on your neck. Not to mention, the device has an in-built safety feature that will automatically turn both the HMD and your phone off once they have reached overheating levels. This is a great feature to have as it can prevent both the device and the phone from being irreversibly damaged. However, there are much more improvements to be desired for GearVR. Some users have complained about the lens fogging up, especially when the unit heats up, making using the device almost impossible. There are also complaints that the field of view is a tad bit too small for compatible phones that have smaller screen dimensions. Thus, if you’re using a bigger phone like the Galaxy S6 Edge+, and Galaxy Note 5, you will have a much better virtual experience as compared to users of the Galaxy S6 Edge or Galaxy S6. Let’s not forget about the screen door effect that GearVR purportedly has, whereby visible fine lines can be seen in between pixels on a display. This makes it feel as though you're looking out of a screen door, and hence, its name. Nonetheless, this effect is something that you can gradually get used to over time and isn’t a huge problem in terms of using the device. The downsides of GearVR aside, the device comes so highly recommended as it is currently the only phone-powered HMD that can access the Oculus store, called Oculus Home, in addition to Google Play. Wait, back up a bit - what is this “Oculus Home”? Well, Oculus Home can be simply described as a platform for virtual reality games; much like Steam is a platform for PC games. It is going to be a main platform where players will be able to obtain most of their virtual reality games from. In fact, the Oculus Home currently has quite a range of VR games on it already and it is comparable to Google Play in its early days. Sounds like an exciting adventure just waiting to happen? Well, it is! For a mere $99, you can purchase the GearVR HMD, lock in your high-end and compatible smartphone, and launch yourself into the immersive world of virtual reality! The device you bought will come along with a nifty Samsung Bluetooth controller as well. On a side note, Samsung has recently filed a patent indicating that the company is currently working on a dedicated Gear VR controller, so future potential owners of the GearVR device will have something better to look forward to! That said, the phone itself can be rather expensive... being high-end and all... and the charger for the HMD comes separately and at a price. This charger is rather important as it will allow you to enjoy virtual reality for longer periods of time without draining the battery power of your smartphone - trust me, the battery of your smartphone won’t last long against the power-hungry GearVR. All in all, GearVR shows a lot of promise as a top-of-the-line phone-powered HMD. It is able to offer high quality virtual reality experiences for a fraction of the cost needed to use a PC-powered HMD. Like most new technologies though, there is still plenty of room for improvement, and hopefully, that will come in time as the technological level of the world advances.